In England, Christmas Eve is the time to tell ghost stories. A reflection on some of the city's spookiest nooks and crannies. What is it that makes London such a ghostly city? I’ve been living here most of my life and the place still gives me the willies sometimes. In December, the sun seems to rise and set in the time it takes to make a cup of tea, while fog and damp insinuate their way into every dark, slimy corner. The city’s many steam age buildings, silent streets and still back gardens feel almost ludicrously spooky. Even the view from my kitchen window looks like the cover of an airport horror novel, with ravens pecking at a dying cedar in the half-light. Perhaps as a response to this creeping darkness, Christmas Eve (not Halloween) is the traditional time for telling ghost stories in Britain, the thought of unspeakable things lurking outside the window supposedly making indoors feel cozier. And in London, you never have to travel far beyond your doorstep to find some allegedly haunted spot. Indeed, in the neighborhood where I grew up, they cropped up on every other corner. There was the hulking neogothic house next to my elementary school, whose pointed-arched windows starting belching smoke one afternoon. Funnily enough, no adult mentioned to us that the house was the rumored site of a recent vampire staking. A few years before (I later discovered), the house had been raided by a group of self-proclaimed vampire hunters, following a bizarre media sensation about strange goings-on in the nearby cemetery. This band of vigilantes claimed to have destroyed some unspeakable creature in the basement, and while everyone seems to have treated the rumors as utterly ludicrous, I can’t help wondering if some people weren’t relieved to see the place go. Just behind the house lay an abandoned railway line, whose eeriness was such that Stephen King re-imagined it as a portal to a parallel world, in a short story he wrote after staying nearby. This too had its local ghost, a not especially scary-sounding "goat man," commemorated by a statue we kids used to dare each other to walk past in the dark (as a lifelong wimp, I always refused). The line led to an old village nearby, long since swallowed up by the city, where terror was struck into locals crossing the former green by the phantom of a Jacobean chicken. Running steeply down from this square was a lane that was a sort of overcrowded slum for ghosts, so common were alleged spook sightings there. And a little further over on Hampstead Heath, there was a dell where ghosts were supposed to appear banshee-style, to warn you of impending deaths. There’s clearly something in the very fabric of London that induces this kind of tale-telling. There wasn’t anything really there, of course, but there’s clearly something in the very fabric of London that induces this kind of tale-telling. The city’s occasional creepiness has been actively fabricated, a product of its history of destruction and haphazard rebuilding. 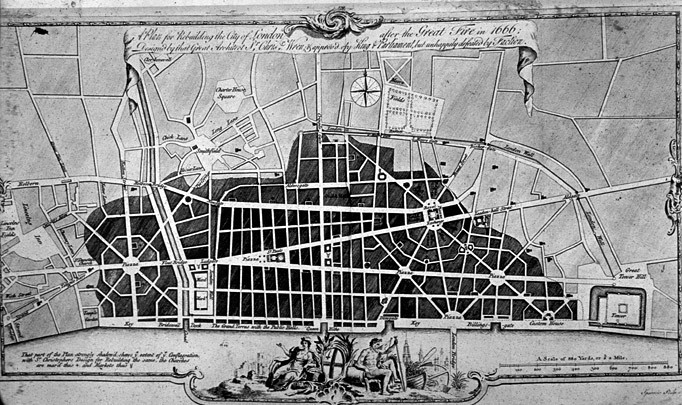 It has long been a canvas for only semi-realized grand designs, from Christopher Wren’s 17th century plans to turn the city into a second Florence to 1970s schemes to flatten historic Covent Garden Market. Destruction in the form of fires, bombing and brutal redevelopment have also reshaped the city, scorching the past away supposedly to replace it with a brighter, sunnier future. That future never quite arrives. Great schemes get their ambitions slashed, while traces of the past are never truly effaced. London thus resembles an architectural lumber room whose random contents are waiting to be sorted into their correct order. Cottages still cower under the expressway and graveyards are shaken by passing trains. Glass and steel towers may rise, but they do so over pits full of plague corpses or along the line of old ditches once filled with dead dogs. Everywhere there are semi-effaced reminders of the past, sometimes delightful, sometimes sullen and (to the suggestible mind) resentful. St. Pancras Churchyard is a classic example of London layering. A site of Christian worship since Roman times, it's now stacked with gravestones piled together in Victorian times to make way for a railway. The project was conducted by none other than trainee architect and future writer Thomas Hardy. London has so many of these part-effaced remnants that it’s no wonder stories get spun around them. It’s so easy here to imagine the fields being paved over, the bombs falling, the wrecking ball swinging, and the old inhabitants being moved on. With old housing projects being demolished, skyscrapers rising and rent hikes scattering people from their old neighbourhoods, London is still changing radically, of course. And I sometimes wonder what we present day Londoners are leaving behind of ourselves, and whether it too might give future residents the shivers on a dark night.